Topics: Mancunia Travel, Holidays For All, and Brochure. The estimated 87 daily visitors, each view 1.50 pages on average. Its 2 nameservers are ns1.webmacsters2.co.uk, and ns2.webmacsters2.co.uk. Ded-lds-2 (England, Leeds) is the location of the Apache/2 server. 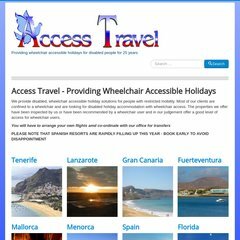 Access-travel.co.uk's server IP number is 94.136.36.120. Website load time is 470 milliseconds, slower than 94% of other measured websites. As well, a ping to the server is timed at 105 ms.